Postgraduate students attending the 12th biennial conference of the Australian and New Zealand Shakespeare Association (ANZSA), “Shakespearean Perceptions,” are also invited to participate in a free postgraduate workshop on 1 October, at the University of Southern Queensland. The workshop will be facilitated by Emeritus Professor Helen Ostovich (McMaster University) and Professor Evelyn Tribble (University of Otago). Literary & performance studies have a long history of appropriating or borrowing from other disciplines in developing new methodology: psychoanalytic criticism and historicist criticism are only two examples of such cross-disciplinary borrowing. But working across disciplines is often problematic; it is notoriously difficult to gain a full understanding of the target discipline, and there are many examples of ‘cherry-picking’ a cognate discipline, or preferring only those studies that seem to uphold one’s pre-existing beliefs (a form of confirmation bias, if you will). How do researchers map disciplines other than their own? What are the best approaches to working across disciplines or, for that matter, taking on a new sub-field of one’s own discipline (e.g. theatre history). Workshop facilitators will talk about their own practices and examine one or two case studies, circulated in advance. Participants will be invited to bring particular examples from their own research for discussion. 5. Options for digital editions: voice over, film clips, traditional word-searches on LEME, full streaming video of productions, etc. Queries should be directed to the postgraduate workshop coordinators, David McInnis (mcinnisd@unimelb.edu.au) and Brett D. Hirsch (brett.hirsch@uwa.edu.au). 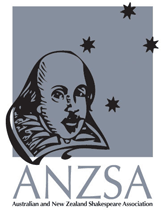 Postgraduate students who are presenting papers at the 12th biennial conference of the Australian and New Zealand Shakespeare Association (ANZSA), “Shakespearean Perceptions,” are invited to apply for an ANZSA postgraduate bursary to assist with the cost of travel to the conference. Bursaries will be awarded on a competitive basis and are scaled on the basis of distance from the venue (up to $750 for recipients travelling from Perth or outside Australia, $500 from Adelaide, Melbourne, Hobart or Australian destinations of similar distance, $250 from Sydney, and $150 from Brisbane). Delegates whose point of origin is less than 100 km from Toowoomba will be ineligible to apply. It will be a condition of receipt of a bursary that the recipient attend the postgraduate workshop at the University of Southern Queensland (1 October, 2014). Applicants must have been accepted to present at the conference prior to submitting an application. All interested postgraduates are reminded that the final call for papers for the conference closes on 27 June, 2014. Bursaries will be available in the form of a reimbursement cheque upon arrival at the postgraduate workshop–funding is not available in advance of travel. To apply, send a CV (maximum 3 pages) and a 250 word statement addressing the benefit that attendance at the conference will give to the applicant’s research goals. Applications should be sent to: Shakespeare.Symposiums@usq.edu.au. Closing date for applications for bursaries will be 18 July.